The job of your advertising is to drive your customers to your business. Your website represents your business on the internet, and once a potential customer finds themselves on it the effectiveness of the site is entirely responsible for getting them to take the next step and contact you. Marketing is an end to end process, and the website you build represents the last step in that process. It must be targeted directly and specifically to the people who are landing on it, and it must achieve measureable business outcomes. Often a company will build a site without this in mind, and it will exist out on the internet and get no traffic. It can be the most attractive site in the world, but if it doesn't create customers what is it good for? We have the skills and experience to make your website work for you. 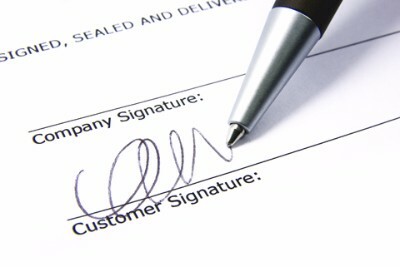 Get them to sign on the line that is dotted. Your website needs a goal. That goal should be measurable, and it should have a direct impact on your bottom line. Whether you're trying to sell a product or a service your website should be designed to actually generate those sales. Whether it's compelling people to pick up the phone and call, send an email, fill out a survey, or quit their job and move overseas to work on your farm your goal should be specific and action oriented, and your website should be entirely focused around achieving that goal. Aside from customers driven to your site via targeted advertisements, the largest source of visitors to your site will be from organic searches. When someone goes to Google and searches for something they make their decision to follow a result based primarily on position and specificity. You need to do what you can to encourage the search engine to list your site as close to the top as possible, and the key to this is novel content. Every search engine algorithm prioritizes results that have legitimacy on the internet, and they determine this legitimacy largely based on the number of links that are pointing to a site from other sites. The best way to get links to your site is to give people a reason to link to you, and that won't happen if the content on your site is boring or stolen from elsewhere. Generating novel content, whether on a blog or on a static services page like this one, is key to getting found online. Search engines used to be pretty dumb when it came to figuring out what was good content and what was a thinly veiled attempt at generating traffic. As a result you used to be able to cover your pages in keywords to bias search results in your favor. This is no longer the case. Thanks largely to the proliferation of machine learning algorithms it is trivial for a search engine to determine whether you're honestly trying to help people in good faith, or if you're simply trying to trick people into visiting. As a result the key to actually generating traffic is the creation of authentically informative, intelligent and compelling content. This is hard, but it's not impossible. You don't have to be perfect, you just need to be better than the average of your competition. The best way to do this is to create content based on the things you have learned over your years of experience doing what you love. Nobody knows your product or service like you do, so focus on writing about what you know.